The “A” series: Warmup workbooks to practice basic structures - Psycholinguistic Technologies, Inc. The workbooks in the “A” series are for practicing very basic structures. 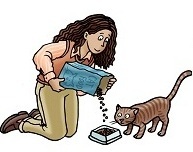 The “A1 Simple Sentences” workbook trains simple subject-verb-object sentences like “The woman is feeding the cat”. 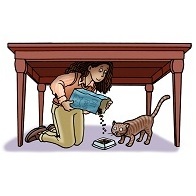 In the “A2 Sentences with Prepositions” workbook, a preposition is added to the picture; for example, “The woman is feeding the cat under the table“. The “A3 BUILD Simple Sentences with Prepositions” workbook contains 30 two-picture sequences, showing a simple subject-verb-object sentence followed by the version with the prepositional phrase.